It's All About Great-tasting Nutrition! 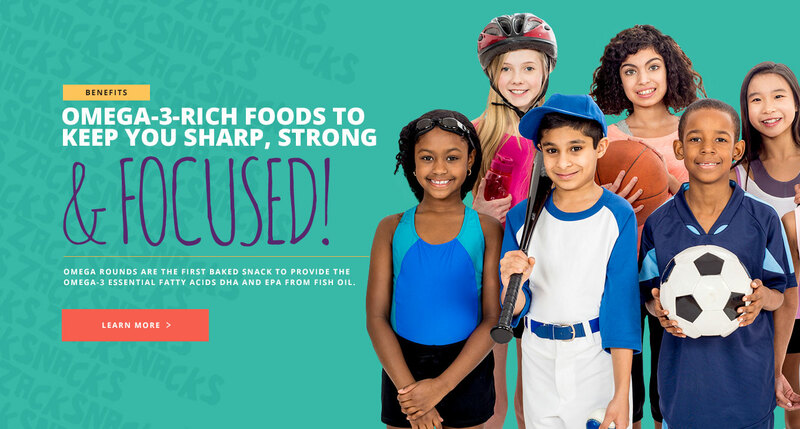 Zack Snacks are rich in Omega-3s, which can support heart health as well as healthy brain and cognitive function in children and adults. 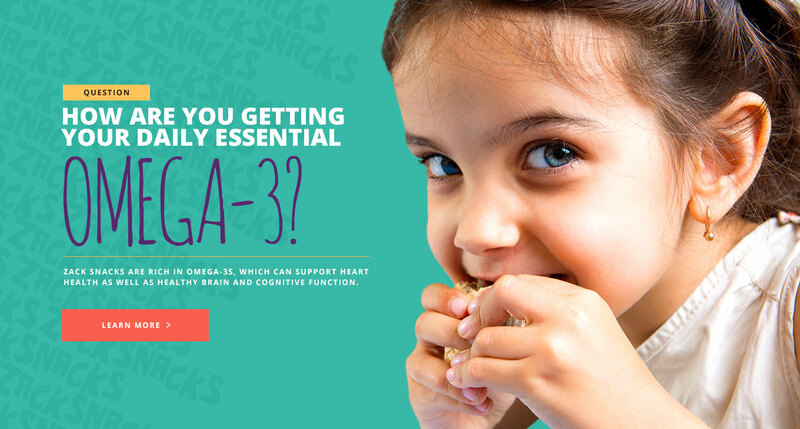 Omega-3s may also assist in maintaining a healthy blood sugar profile, keeping you focused and sharp. Protein and fiber in Zack Snacks help you to feel full and satisfied which can assist in maintaining a healthy weight. 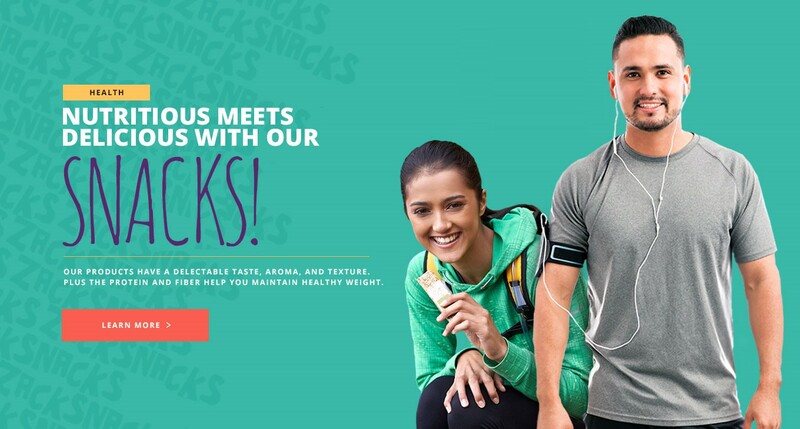 Nutritious meets delicious with Zack Snacks. Our natural snacks contain no artificial ingredients. Below are excerpts from this study report by William S. Harris, PhD and president of OmegaQuant Analytics, LLC. "Dear Mr. Ansley, I would like to share with you the results of two pilot studies in which subjects ate your "Omega Rounds" and we tested the effects on the Omega-3 Index (red blood cell levels of EPA+DHA). The question in both studies was, 'Can Omega Rounds significantly impact the Omega-3 Index?'" "In the first we found a statistically significant 29% increase (p<0.0001) in the Omega-3 Index. In the second, we found significant increases at both 4 weeks (10%, p=0.007) and 8 weeks (14%, p=0.0007). It is interesting that comparing the percent increases at 8 weeks between studies, 6 Rounds per day raised the Index by 29% and 3 per day raised it 14%. This strongly suggests a linear dose-response effect even in two very different populations." "To tell the truth, I was not expecting to see much of an effect of such a small dose of EPA+DHA on the Omega-3 Index, especially in this relatively short period of time. As I mentioned to you at the outset, since the Omega-3 Index is a measure of red blood cell EPA+DHA levels and since the red blood cell population takes about 4 months to completely replace itself, we usually wait for 4 months to re-test. The constraints of your studies demanded 1- and 2-month testing, and so I was not optimistic. But based on these findings, I think it is safe to conclude that Omega Rounds have a clearly detectable effect on red blood cell (and therefore tissue) omega-3 levels, and that this effect is dependent on both the number of Rounds consumed and the duration of consumption." Following is an excerpt from a paper describing Cleveland HeartLab's test markers for Omega-3 levels in the human body. - lipid abnormalities leading to altered cholesterol metabolism and long-term cardiovascular risk"
"Professional and extreme athletes partake in rigorous training and conditioning in order to achieve lofty goals on an elite performance level. Rapid recovery and improved mental recovery are vital to this process, but is often elusive, as is raising the level of training at his level. Despite this level of training long term health and extended lifespan of this level of athletes does not surpass that of the average individual."